Before I start this post declaring my love for the miracle product that is Nails Inc's 'Lilly Road', I just have to clarify something - I haven't misspelt 'Lily' for 'Lilly'. Nails Inc have this quirky thing of naming their polishes after streets in London which, as a born-and-bred Londoner, I think is really cute. You can only imagine my delight when I was walking down Duke Street near Selfridges last week when I realised that I was wearing 'Duke Street' on my nails. What can I say, I'm easily amused. Way back in March when this polish made it into my shopping bag, 'Lilly Road' was every inch the impulse purchase. At £14 a pop, Nails Inc isn't exactly student-budget-friendly. But I was in that dangerously 'spendy' mood and like I do every time I buy something beauty-related that's a little too far out of my price range, I justify it to myself by saying 'at least it gives me something to blog about!' And four months later, I've certainly gotten my money's worth - this will be it's se third post and there have been too many Instagrams to count. Like I always say, 'when in doubt, go with Lilly Road'. My nail polish obsession is something that's pretty well documented here on the blog (if you type 'nail polish' into the search bar, you'll see what I mean!) but I'm usually pretty fickle when it comes to the polishes themselves. I've never really had a colour I always come back to - if I get bored, I buy a new one. It's a money-wasting habit if ever there was one ha. 'Lilly Road', along with 'Duke Street', is the only polish I take off and then reapply immediately. In the beauty blogging world, this is the definition of commitment. But when you find the perfect colour (i.e. a shade that goes with any outfit and treads the line of being feminine without being too 'pink') combined with a truly mesmerising formula and you have the dream that is 'Lilly Road'. The wide brush also makes application so quick and easy, I can paint my nails with eyes fixed to the computer screen watching Netflix - 'Everybody Loves Raymond' is my current poison of choice. If I sit and down and do my nails properly, base coat and all, I find that 'Lilly Road' usually lasts me the best part of a week before I need to top up the manicure. As a nail polish junkie, this is pretty good going. Especially as my job in retail largely consists of crushing boxes, cleaning, and scouring in the stockroom - it's not exactly manicure-friendly work. But if I rush the nail-painting process, like I did on Friday night when I panic-painted my nails before leaving for Cornwall the next morning, then the varnish is obviously not as durable. I'm a perfectionist when it comes to my nails and when I woke up the next morning with smudges, it wasn't long before I was buying nail polish remover in our remote holiday destination and starting all over again. 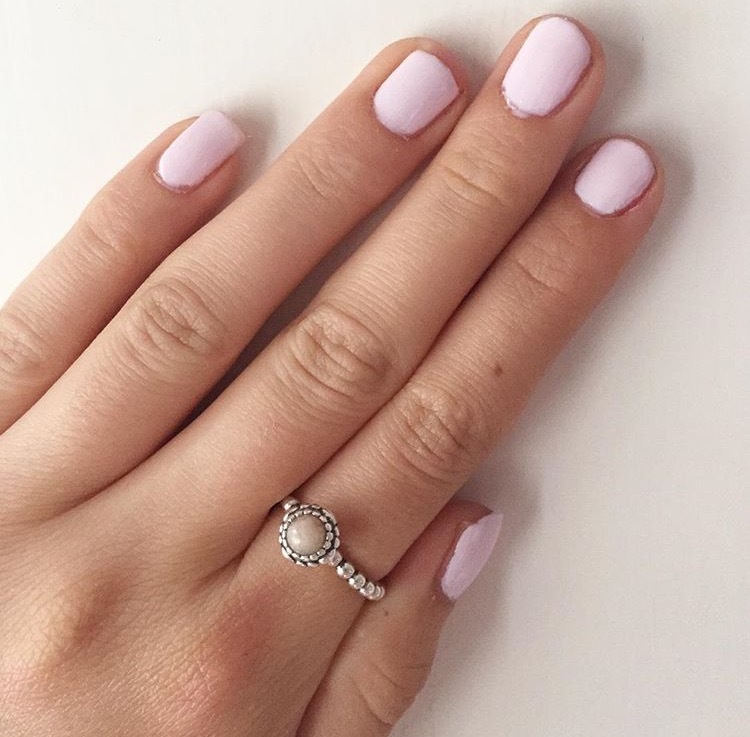 But isn't it worth it for the perfect manicure? 'Lilly Road' is the most beautiful, neutral shade of pink - the above photo has enhanced its pink tones, it's actually a much cooler shade. As part of 'The New White' range, I think it adds a touch of classiness to my ever-expanding nail polish collection. I can't get enough of it and it's fast become my trademark. This might even be the first time I finish a bottle of nail polish - my varnishes usually dry out before I get a chance to use them all up. One of my favourite things to do at uni is painting my friends' nails while having girly chats and listening to cheesy music - i.e. sticking to every cliché in the book! But even amongst my friends, and I'd say we all have our own unique style, 'Lilly Road' has been a favourite. It's one of those universal feminine, easy-to-wear colours and for that, I have to say it's my all-time favourite polish. Who would have thought? 10 years of collecting nail polish and I've found The One - 'Lilly Road' was worth the wait. She's a total catch.